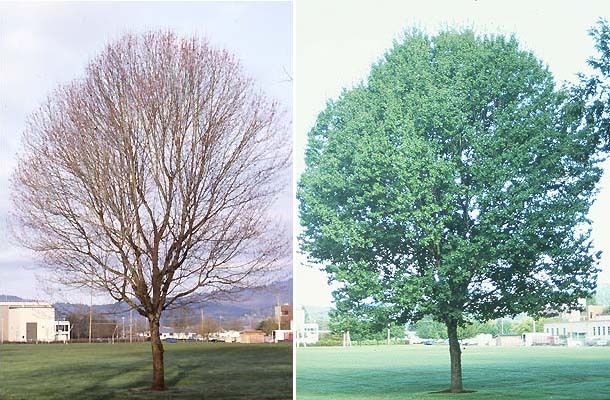 Broadleaf deciduous tree, 60-75(100) ft [18-23(30) m], develops ascending branches, irregular, ovoid or rounded crown. 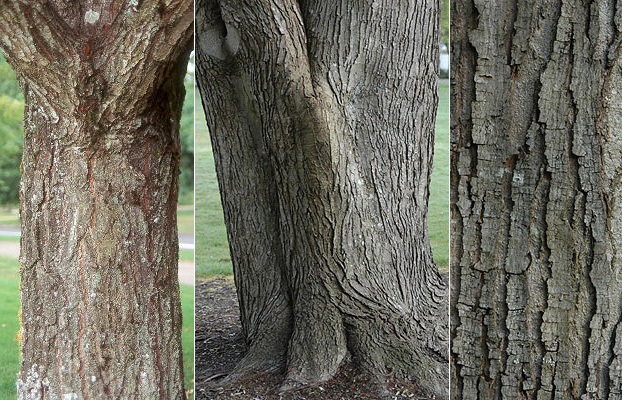 Bark is smooth, light gray on young trees, developing to dark gray, rough, and furrowed on older trees. Leaves opposite, simple, 5-10(13) cm long and wide, usually with 3 serrated lobes, but sometimes 5, base rounded or subcordate, medium to dark green above, silvery below and usually pubescent on veins. 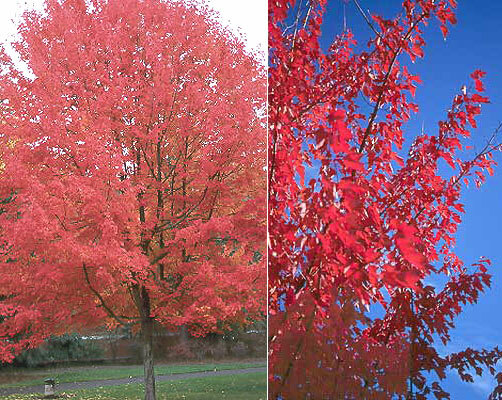 (Compare to other common landscape maples.) 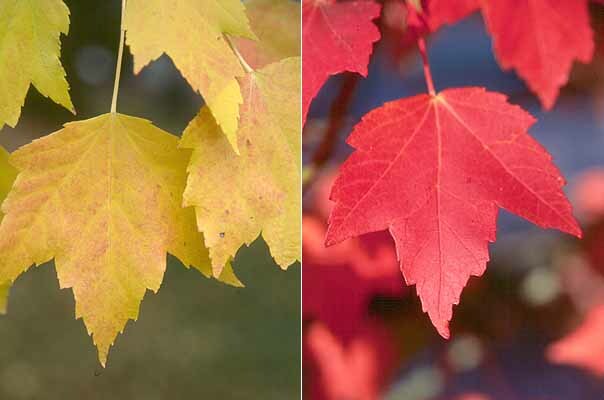 Fall leaf color may vary from green-yellow, yellow, to brilliant red, one of the first trees to color. 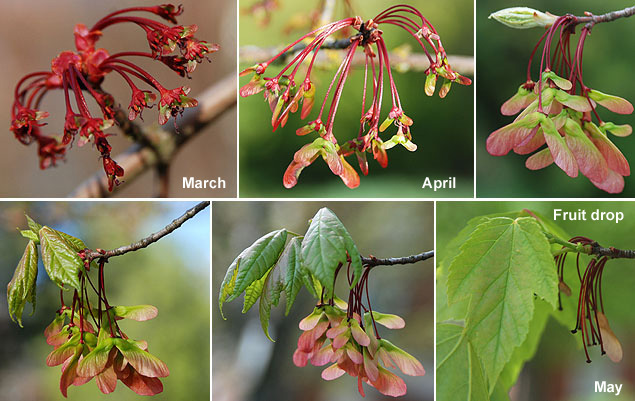 Flowers red (source of "red maple" name), small petals and sepals, appear before leaves, one of the first maples to bloom in spring or late winter, male (pollen) flowers and female (seed) flowers often on different branches of the same tree, young trees may have only one type of flowers. Fruit, a samara, wings 12-15 mm long, about a 60° between them, shed by early summer. 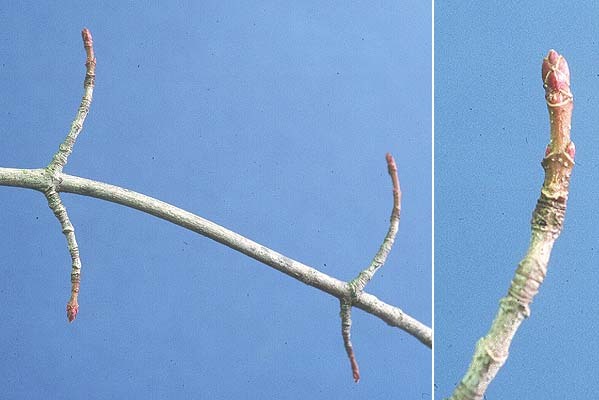 In winter, tree shows long shoots with many short shoots. 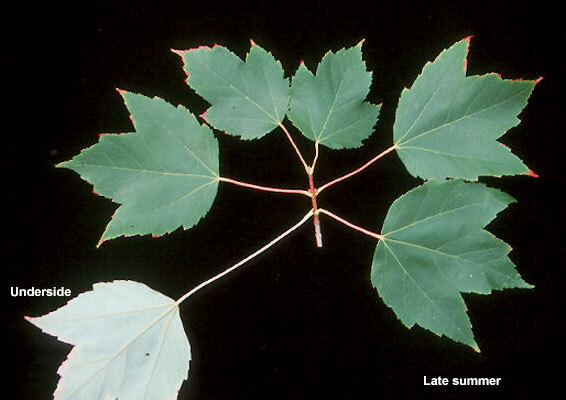 Sun, very tolerant of soils, but prefers slightly acid and moist conditions (occurs naturally in low, wet areas, hence one of its common names, Swamp Maple). It may not be particularly urban tolerant and has a tendency to produce surface roots. Hardy to USDA Zone 4 (some selections Zone 3) Large native range, from Newfoundland to Florida west to Minnesota, Oklahoma, Texas. 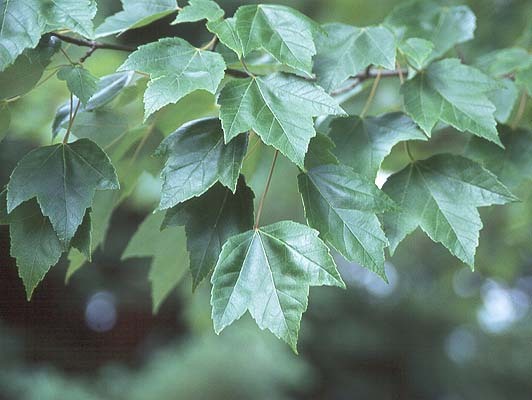 Part of its range overlaps with that of Acer saccharinum, Silver Maple, with which it hybridizes, intermediate forms often occur. Autumn Flame® - dense rounded spreading branches, 35 × 35 ft (10 × 10 m), male, medium green foliage, bright red fall color, one of the earliest to color. Hardy to USDA Zone 3b Introduced in about 1964 by A. McGill & Sons nursery, Fairview, Oregon (PP 2377). ‘Autumn Spire’ - shows early fall color which progresses from deep-purple red to bright red. 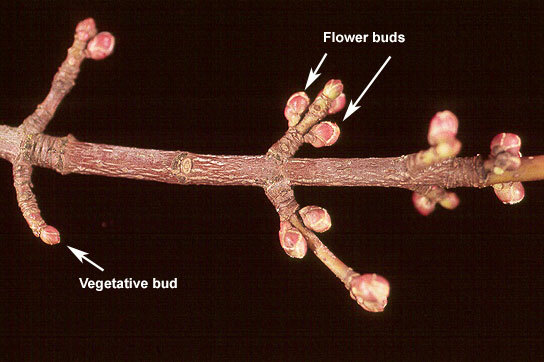 Only male flowers are observed in spring, hence no seeds are formed (i.e., seedless). ‘Bowhall’ - very narrow, upright, 40 × 15 ft (12 × 4.5 m), female, foliage medium green, yellow-orange to reddish-orange fall color. Hardy to USDA Zone 4 Selected by the Scanlon nursery of Ohio in 1946 and named in 1951, the original tree was near Cleveland and named after the road on which it was discovered (Jacobson, 1996). Karpick® - narrow oval shape, 40 × 20 ft (12 × 6 m), male, foliage yellow to orange in fall. Hardy to USDA Zone 4. 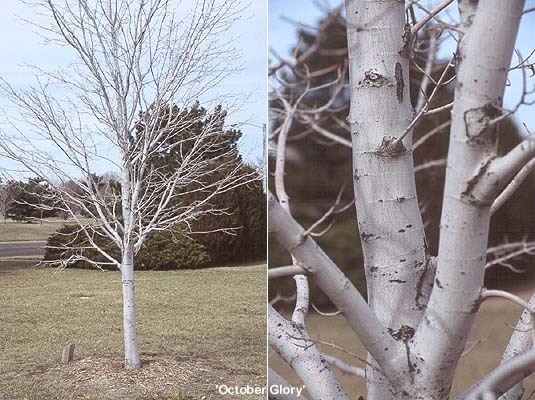 Introduced in 1992 by the Schichtel nursery of Orchard Park, New York and named for Frank E. Karpick (1902-1990) a city forester of Buffalo, NY. Northwood® - broadly oval to rounded, open, 40 × 35 ft (12 × 11 m), male, foliage medium to dark green, reddish fall color. Hardy to USDA Zone 3, maybe the hardiest of the Red Maples. Discovered by Leon Snyder in northern Minnesota and introduced by the Minnesota Landscape Arboretum in 1980. October Glory® - broadly oval to round, 40 × 35 ft (12 × 11 m), female, leaves medium glossy green with long red stems (petioles), fall color deep red to reddish-purple, one of the last to color in fall. Hardy to USDA Zone 4b, reportedly better adapted to areas with mild winters and hot summers than other selections. Introduced in about 1961 by Princeton nursery of New Jersey (PP 2116). Redpointe® - (syn. ‘Frank Jr.’) broadly pyramidal form, dominant central leader, fast growing, 45 × 30 ft (14 × 10 m). Leaves dark green, fall foliage is brilliant red. Hardy to USDA Zone 5. Developed Frank Schmidt & Co. nursery, Boring, Oregon, introduced about 2006 (PP16,769). Red Sunset® - (syn. 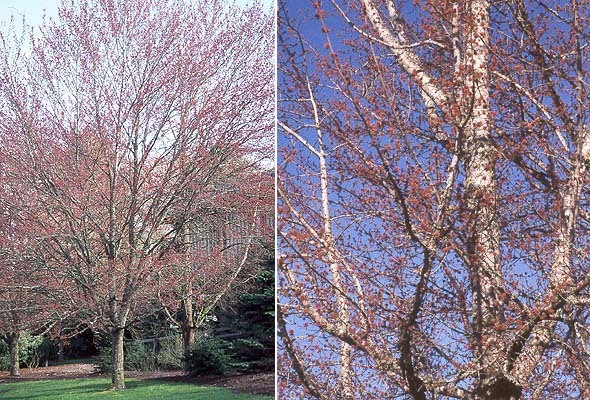 ‘Franksred’) upright branching, oval shape, 45 × 35 ft (14 × 11 m), female, leaves strongly 3-lobed, dark, glossy green, fall foliage is brilliant orange-red to red. Hardy to USDA Zone 4 Developed in the 1940s by J. Frank Schmidt, Jr. of J. Frank Schmidt & Sons nursery, Boring, Oregon, introduced in 1966. 'Scanlon' - compact conical crown, narrow, upright, with strong central leader, 40 × 15 ft (12 × 4.5 m), fall color is yellow-orange to reddish-orange. Hardy to USDA Zone 4. Apparently 'Scanlon' is a sport of ‘Bowhall’ that was considered a superior stable form having reliable fall color, but the two are very similar and 'Scanlon' my have been sold under the name ‘Bowhall’ for a time. In any case there is great confusion as to which is which (Jacobson, 1996). Dirr (1998) states that 'Scanlon' is no longer common in cultivation. 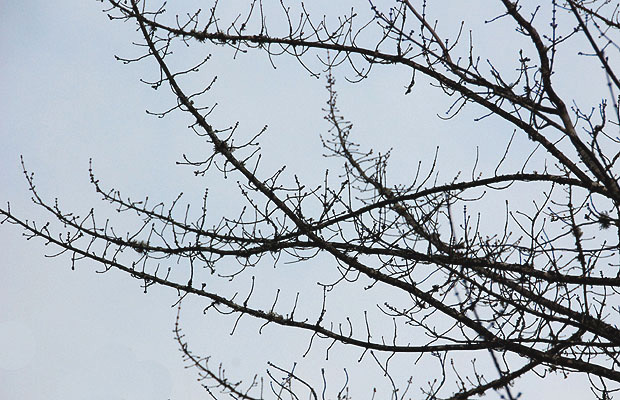 A check in 2006 of the online version of the Oregon Association of Nurseries' Directory and Buyers Guide indicates that 9 wholesale nurseries offer 'Scanlon' and 26 sell ‘Bowhall’, about a half-dozen offer both. In 2019 no wholesale nursery is listed as offering 'Scanlon'. 'Scanlon' was named and patented by E. H. Scanlon (PP 1722) in 1958, some 7 years after he had introduced ‘Bowhall’. 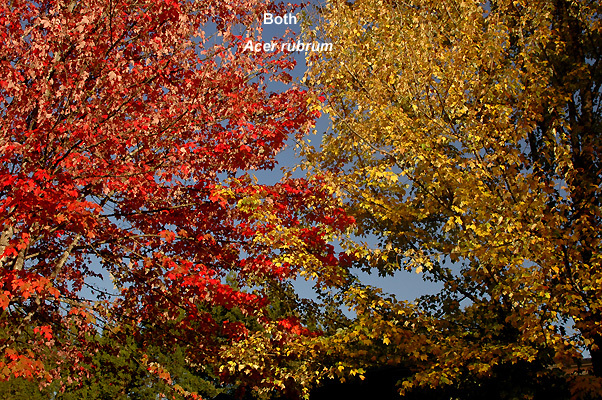 Selections resulting from a cross of A. rubrum × A. saccharinum (Silver Maple) are know as A. 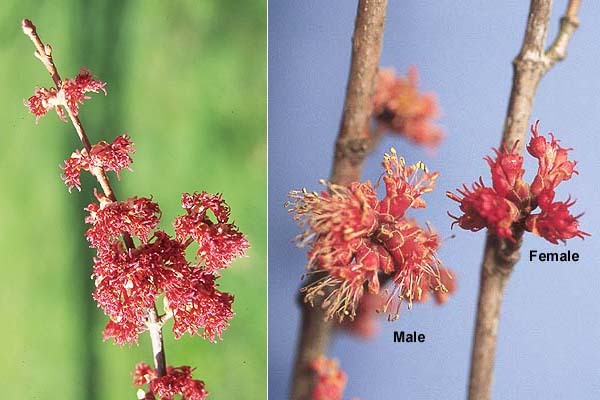 × freemanii (Freeman Maple) but are frequently listed as Red Maples. Some of these selections include 'Armstrong', Autumn Blaze®, Celebration™, and 'Morgan'. 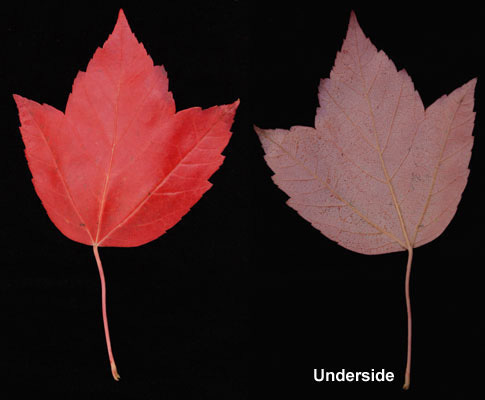 In the development of Red Maple selections hybrization with Silver Maple may occur to varying degrees. See A. × freemanii (info). Oregon State Univ. campus: several along the north side of Milam, many on campus. 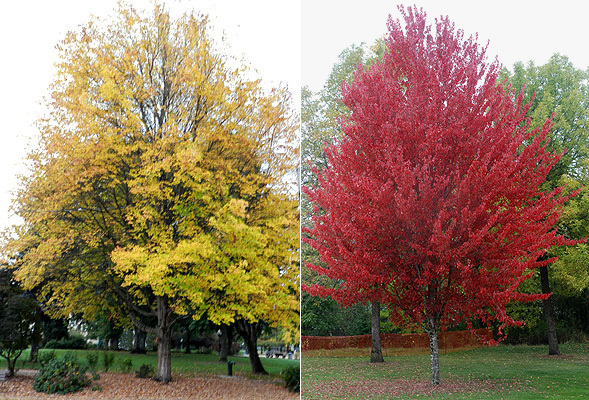 Corvallis: along First St, River Front Park, (selections: October Glory® and Red Sunset®).